Have you decided to learn to sew? Congratulations! 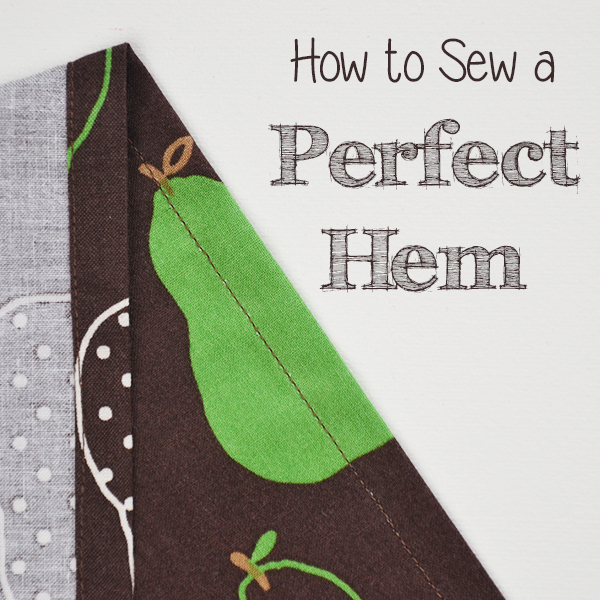 Sewing is an amazingly versatile art that can be used in loads of different ways! Unless you plan on exclusively sewing by hand, you will probably be asking yourself what the best sewing machine for beginners is. 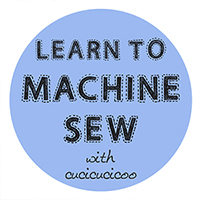 A lot of my readers, especially those following my Learn to Machine Sew course, write to me with specific sewing-related questions, and that is the number one question that I get asked: what sewing machine should I buy? There are a huge number of sewing machine brands and an even huger number of sewing machine models out there, with an insane variety of features. It’s normal that someone who has never put foot to sewing machine pedal would feel overwhelmed when trying to make a choice. But this isn’t an easy question to answer simply because there is no one best sewing machine, or even one best brand. It’s a question of understanding each sewer’s needs and deciding which characteristics will best respond to them. 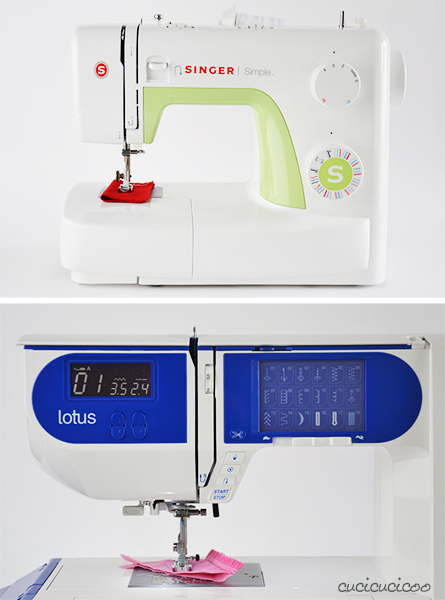 Are you ready to choose your first sewing machine? Let take you through the ten things you need to know when choosing a sewing machine and what to look for in order to get the best match for your sewing needs! I buy a lot of things online, but do NOT buy a sewing machine online, and I’d try to avoid buying them from big mall chain stores, too. I always advise new sewists to go to local sewing machine shops, where you will get lots of assistance from the knowledgeable staff. The people working in any decent shop will know a LOT about the different brands and models that they deal with, will explain the differences and will let you try out at least one or two models before making a decision. If they don’t do any of these things, or if you feel like you’re being excessively pressured to purchase, walk out the door and go to a different shop. Another great thing about authorized sellers is that they will often take back your old sewing machine when you’re ready to move up to a better and more expensive machine, and give you a discount on the new one. And if you bought your old machine from them (and have the receipt to prove it), they’re even more likely to give you a bigger discount to reward your loyalty. In my experience, these sellers will often give you good deals if you ask, so don’t consider the original price tag as the final price. Authorized sellers also usually offer great assistance, but ask to make sure before purchasing. In Italy, at least, all new products are covered by a 2-year warrantee, even if you buy them in a chain store or online. But authorized sellers who also do repairs will sometimes give you an extended warrantee. So if you run into problems with your machine, you can just bring it into the shop where you bought it, instead of having to send it away who knows where. Quality sewing machine shops will also generally show you the basics of your sewing machine once you’ve purchased it, such as how to wind the bobbin, thread the machine, and regulate the various functions. If you have questions, you can ask a knowledgeable person instead of doing a Google search. For a beginner sewer, this can be incredibly important. If you’re an experienced sewer, you can be adventurous and buy a machine online, but I honestly don’t advise doing so. I did once, the story did not end happily, and I ended up losing money to send the malfunctioning machine back. 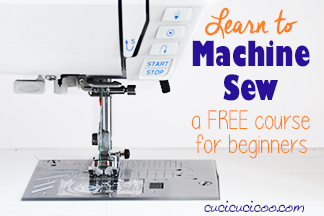 Beginner advice: Buy your machine at a local authorized sewing machine shop. They don’t make them like they used to. It’s a total cliché, but even clichés are sometimes true. Chances are that if you have access to an old machine, it still works great. Older sewing machines are much more heavy duty than machines that are made today and, if taken well care of, they will last virtually forever. There are a few downsides to using an older machine, though. First of all, they won’t be covered under a warrantee, so you’ll have to pay for any cleaning or assistance, which can be annoying if it’s been hidden away in an attic for decades and needs to be given some loving care. This also means that there’s nobody to help you figure out how it works, unless you have a friend who is knowledgeable in these things and will give you a hand. If your older sewing machine doesn’t have a user’s manual, look online and you might be able to download one for your model. And older machine will also have a much more limited number of stitches and features, but then again, so will most very basic sewing machines. Used machines are wonderful because they are frequently such good quality and have the romantic aura about them of their past users and projects. I think that they are a great choice, but perhaps more suited to more experienced sewers. My personal opinion is that a beginner will be able to learn the best on a new machine with all parts in tip-top working order, assistance from a shop, and a user’s manual. 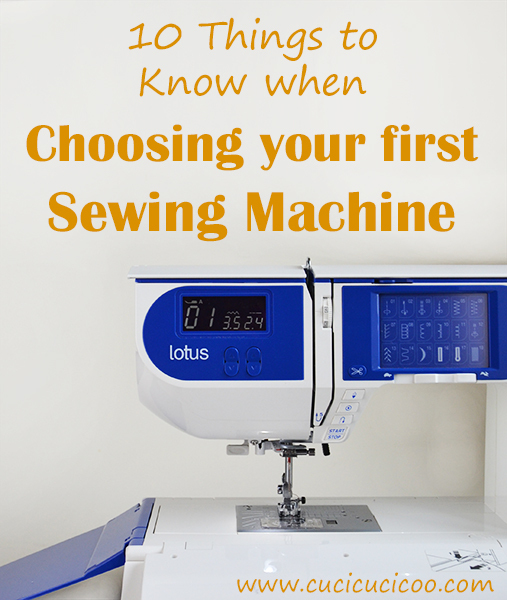 Beginner advice: Choose a new sewing machine when starting out. Once you have more experience, you can branch out into older machines. There are TONS of brands, and I am not willing to put them into any ranking order because all brands have some higher quality and some lower quality models. I personally have owned and extensively used Singer, Necchi, Elna and Global brand machines. Some other brands that I have heard great things about, but not used much (if at all) myself, are Bernina, Janome, Brother, Juki, Pfaff, Husqvarna, Kenmore and Toyota. Both my mother and my grandmother had Singers, so I always gravitated to that brand. However, when I tried out other brands, I realized that they were just as good. Beginner advice: Don’t set your heart on one specific brand. Be open to other possibilities and try out different brands to find the one you like the most. The prices of sewing machines vary greatly depending on the brand, type of machine and the many possible features. You may be tempted to start out with a cheap €99 machine, but realize that you usually get what you pay for. Those cheaper machines usually have low quality plastic parts inside that cannot handle much, won’t sew certain fabrics, and break very easily. 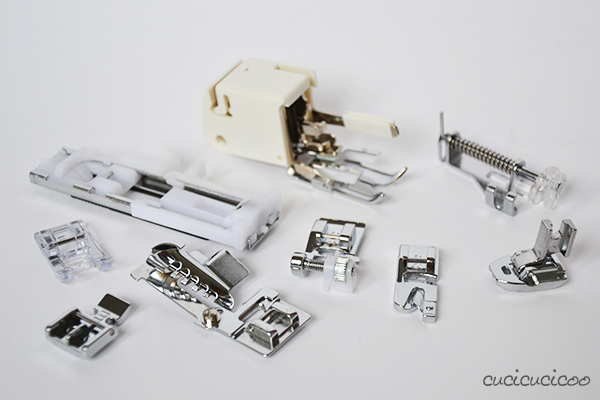 Try to get a machine that is built solidly inside with metal parts. This means that you’ll have to pay a little more, but it’s definitely worth it. You can generally get a halfway decent sewing machine from about €200 and upwards. Beginner advice: Avoid the cheapest models, which will break easily. Be ready to pay at least €200. 5. HOME OR INDUSTRIAL MACHINE? Years ago I was talked into purchasing two used industrial sewing machines, one of which you can see above. Their gargantuan motors were nothing short of impressive and they could sew into ANYTHING. I also really loved how the bobbin got wound automatically as I sewed so that it would be all ready for me when bobbin in use ran out of thread. However, industrial machines are meant to be in factories with lots of other industrial machines, each of which has very few functions. This works perfectly in a production line, where each person and machine sews one specific thing over and over, ad nauseam. They are also very big and VERY heavy, so once you put find a place for them, you’re not going to be moving it for a while. This can be frustrating if you need some technical assistance. If you’re a beginner home sewer, you will want more versatility and mobility than an industrial machine can give you, so go with a home sewing machine. Beginner advice: Buy a home sewing machine, not an industrial machine. 6. TABLE, CABINET OR FREE ARM? I love, love, LOVE the free arm of a sewing machine. It makes life infinitely easier when hemming trousers or sewing around smaller tubes. As far as I know, most sewing machines that are set in a table or cabinet do not have a free arm, which in my book makes them not as useful. I also like to be able to move my sewing machine to other rooms, which you can’t do if it’s part of a piece of furniture. Some of those older machines that get folded down and stored hanging upside down underneath a table can seem very convenient because you get a useful table surface when you’re not using the machine. However, if you’re anything like me, you’ll end up covering that surface with stuff, which will have to be removed every time you want to do some sewing. If you plan to do a lot of patchwork or quilting, you may want a sewing machine in a table so that you can lay your work out on it as you sew. But if you’re beginning, you probably aren’t totally sure what type of sewing you will do the most of, so I suggest getting a regular machine with a free arm and without attached furniture. If you decide that you would like a machine with a table around it, you can always purchase one separately or make one yourself. Beginner advice: Buy a regular sewing machine with a free arm and without a table or cabinet attached. 7. HOW MANY STITCHES DO I NEED? The answer is: one- the straight stitch. How many stitches you want, however, is a totally different matter. I highly suggest having at least the straight stitch, the zig zag stitch and a button or lever to reverse direction for a backstitch. But you will be much happier if you also have at least one stitch for sewing stretchy fabric (such as the triple straight stitch or the stretch stitch), blanket stitch (for appliqué) and a buttonhole stitch. There are literally hundreds of different stitches on some machines, including various types of buttonholes, stretch stitches, edge stitches, satin stitches and gazillions of embroidery stitches. 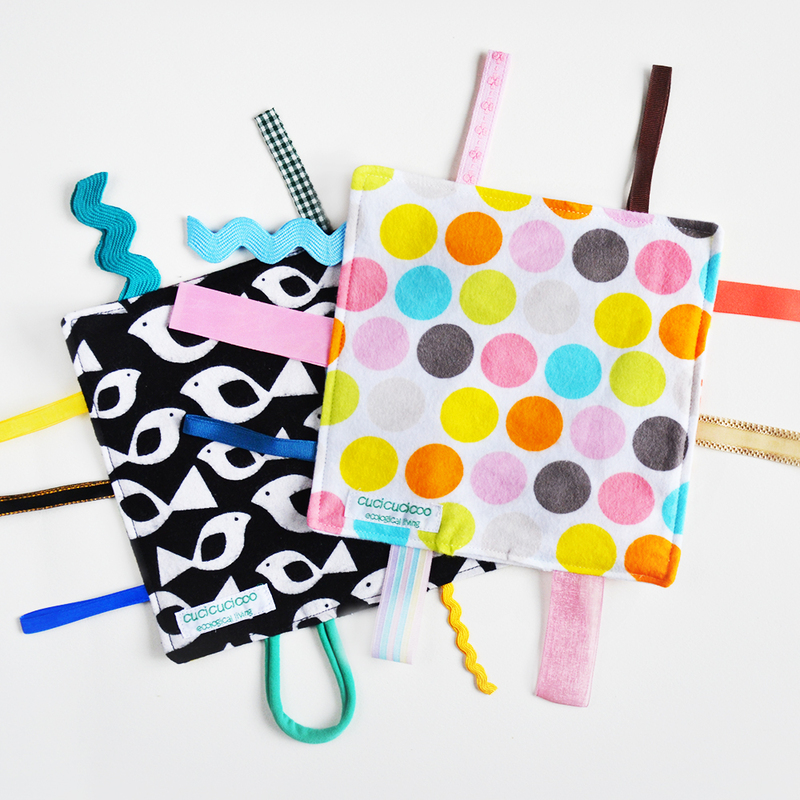 They’re fun to play with, but chances are that you wouldn’t use them until you are more experienced, at which point you can upgrade to a machine with more stitch options. More stitches mean higher cost, so, as far as I’m concerned it makes more sense to start off with a machine with fewer options that will cost less money. Many great beginning machines have anywhere from three to twenty stitches, and I’d say that’s fine to start with. 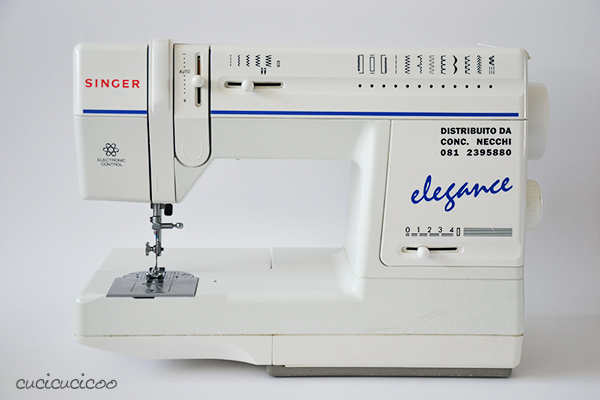 My original Singer Elegance had just nine stitches, plus a buttonhole stitch in three parts, as seen above. That worked for me for years, but I was happy to get some additional stitches when I upgraded. Beginner advice: Stick with fewer stitch options while starting out. Unless you plan on procuring a vintage treadle sewing machine, your machine will be electric. The question is whether to buy a manual or electronic model, and the answer usually comes down to how much money you’re willing to spend and how many stitches you want (see #7). Manual machines have fewer stitches and fewer bells and whistles than electronic ones. On the plus side, there’s nothing electronic to break, so that’s one less thing to potentially have to repair and, if anything does break, it’s easier to repair. There is a wide range of electronic machines. My current Elna Lotus is a lower-end electronic machine, with a relatively limited number of stitches. Higher-end electronic machines can do some truly amazing things. Why didn’t I buy one of those? Mostly because of the cost, but also because I doubted I would really use most of those extra functions for the type of sewing I do. There are a few things that I really love about having an electronic machine, though. First is the thread cutter. It’s so easy to just push the button to cut the thread and raise the needle. I didn’t think that such a little detail could really matter so much, but it does. Another little detail that makes life so much easier is that I was able to set the machine so that when I stop pressing the pedal, the needle always stops in the down position. This way I don’t have to worry about the fabric slipping around and I can rotate the fabric at corners much better. There’s another button to raise the needle and the hand wheel moves the needle manually, if needed. The last thing that I love about having an electronic machine is the digital display with stitch width and length. 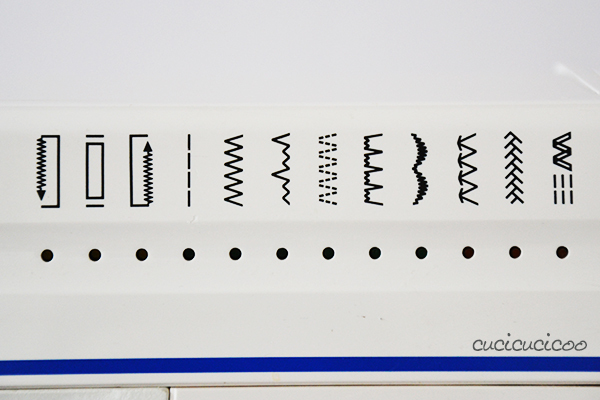 Instead of having to eyeball them with knobs numbered 0 – 5, you get the precision of numbers and decimals. That way I can make notes of the exact stitch widths and lengths used and switch around between them easily when working on a project that require different values in different parts. Beginner advice: If you’re willing to pay extra for a lower-end electronic model, do it. Otherwise a simple manual machine is just fine. 9. WHAT SEWING MACHINE FEET SHOULD BE INCLUDED? Most sewing machines come with a few feet, such as a zig-zag foot, a zipper foot and a buttonhole foot. Higher-end machines usually come with more feet, but in either case, you can always purchase extra feet separately if you want. There are a crazy number of machine feet available for all different uses, but remember not all feet fit all machines. You have to be careful to get feet that are compatible for your model. So I suggest not buying a gazillion feet for your machine, because if you upgrade at some point, you might have to get all new feet. Beginner advice: Make sure you have at least a zig-zag foot, zipper foot and buttonhole foot. You can always buy additional feet as necessary. 10. SHOULD I GET A REGULAR, OVERLOCK, COVERSTITCH OR EMBROIDERY MACHINE? When you’re starting out, you just need a regular, classic sewing machine. 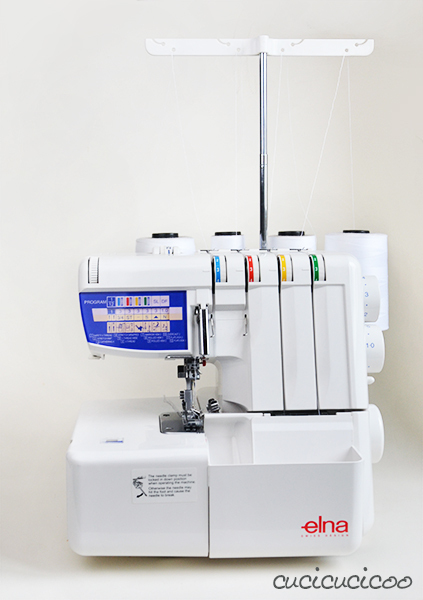 As you get experience, you might want to get an overlock machine (frequently called a serger in the United States), which has 3-5 spools creating a more complex stitch, and a knife which trims the fabric as you sew. There are many uses for the overlocker, but if you’re just starting out, don’t think about it yet, because it’s used in a different way than a regular machine and it’s best to start one thing at a time. 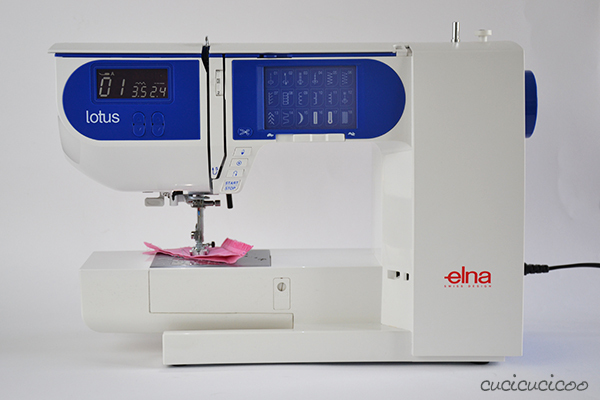 I am currently using the Elna 664 Pro overlocker* pictured above. 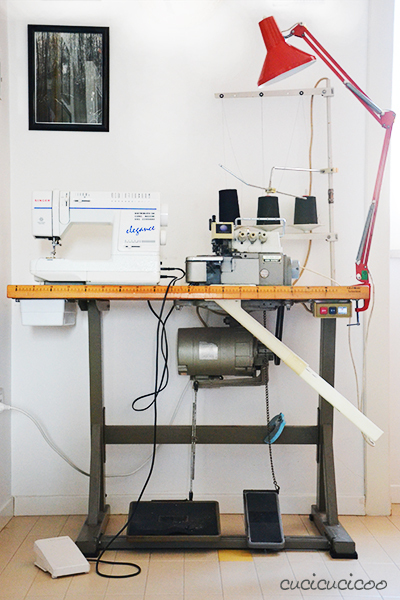 Most home sewers don’t have a coverstitch machine because they cost more than overlockers. 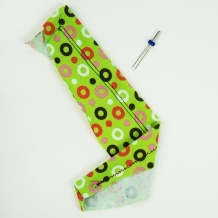 This machine creates stretchy seams which are perfect for hemming knit garments or sewing swim/active wear. 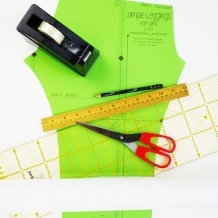 (To find out how to sew knit fabric with a regular sewing machine, read this post.) 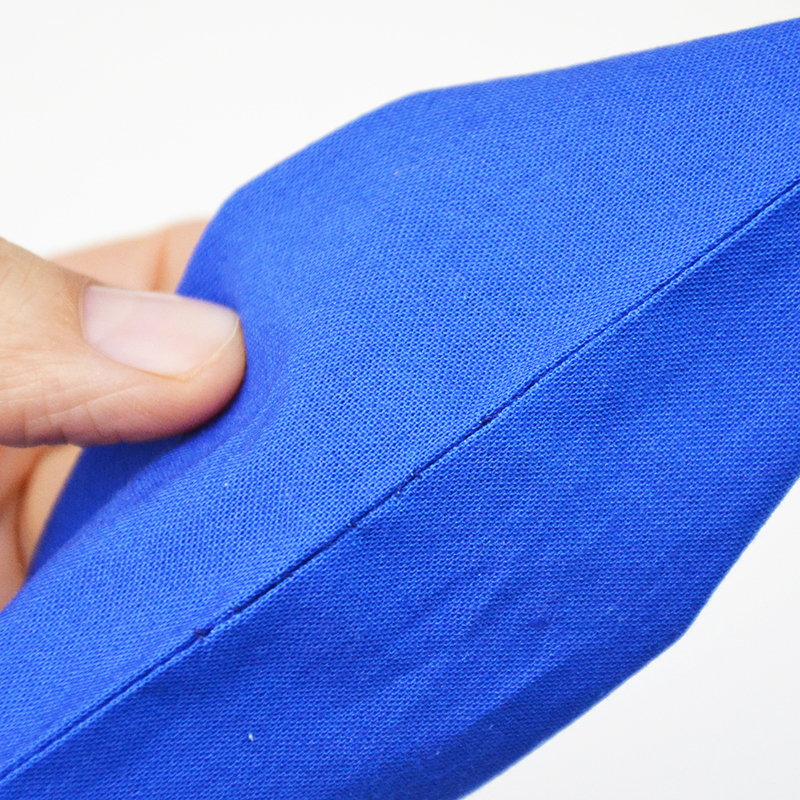 Take a look at the hem of your favorite t-shirt. I’m willing to bet that it has two parallel lines on the front and crisscrossing threads on the back. That’s a coverstitch. You can get a very similar effect by sewing the edge of the fabric with an overlock machine and then sewing it down with a twin needle. There are some machines that are combo overlock and coverstitch machines, but I’ve heard that they are complicated to switch back and forth. I love the look of embroidered embellishments, and that’s exactly what embroidery machines do. There are huge industrial embroidery machines, and smaller home versions, but either way, they are not cheap. Some do only embroidery, while others are combo sewing-embroidery machines. They are all electronic and you can buy embroidery designs that the machine will make for you. Whenever I go to craft fairs, I always spend at least ten minutes standing like a zombie in front of embroidery machines, mesmerized by the needle and colored thread. These machines are amazing, but you will most likely invest in one only if you plan on making a living with sewing, so they are definitely not on your shopping list if you are a beginner. Beginner advice: Buy a regular, classic sewing machine. 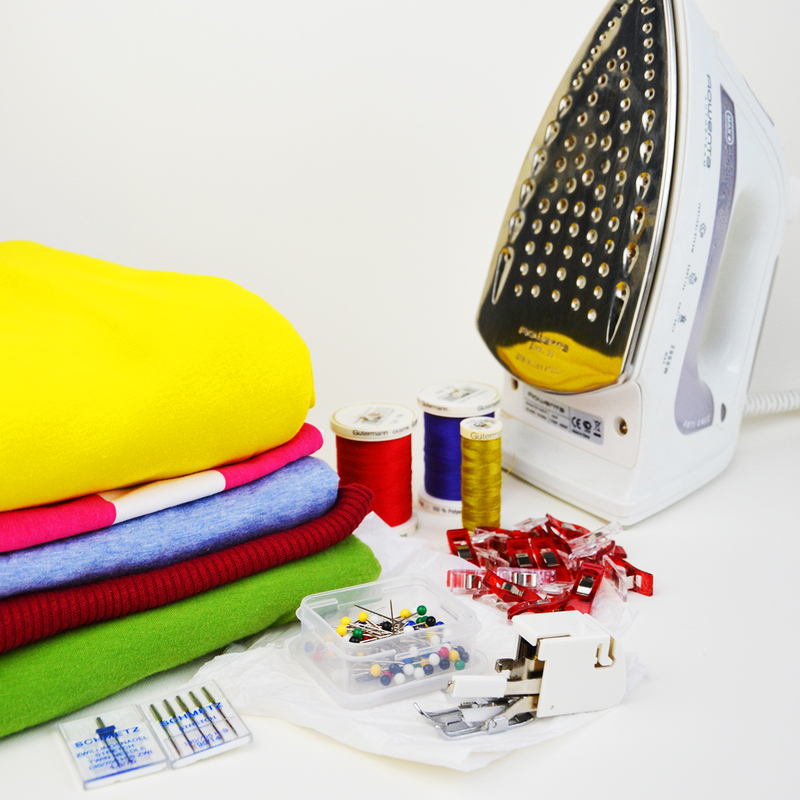 If you become passionate about sewing, you can expand with other machines for other uses! As you can see, there really are a lot of choices to make when buying a sewing machine and it is impossible to name one or two machines that are better than the others because there are just so many different types. When you’re first starting out, the best advice I can give is to visit at least one local sewing machine shop, ask which machines are best suited to the type of sewing you’re interested in, and try some out. Whichever machine feels best to you will probably be the best choice at this time. Unless you have money to burn, stick with a simple, manual machine when starting out. You don’t need many stitches or machine feet when you’re learning, and while the extra features on electronic machines are convenient, they’re definitely not necessary. After you’ve gained some experience, you can always trade in your beginner machine for a higher-end machine with more options. But the most important thing is to love sewing and learn how to use a sewing machine, and you will create amazing work! 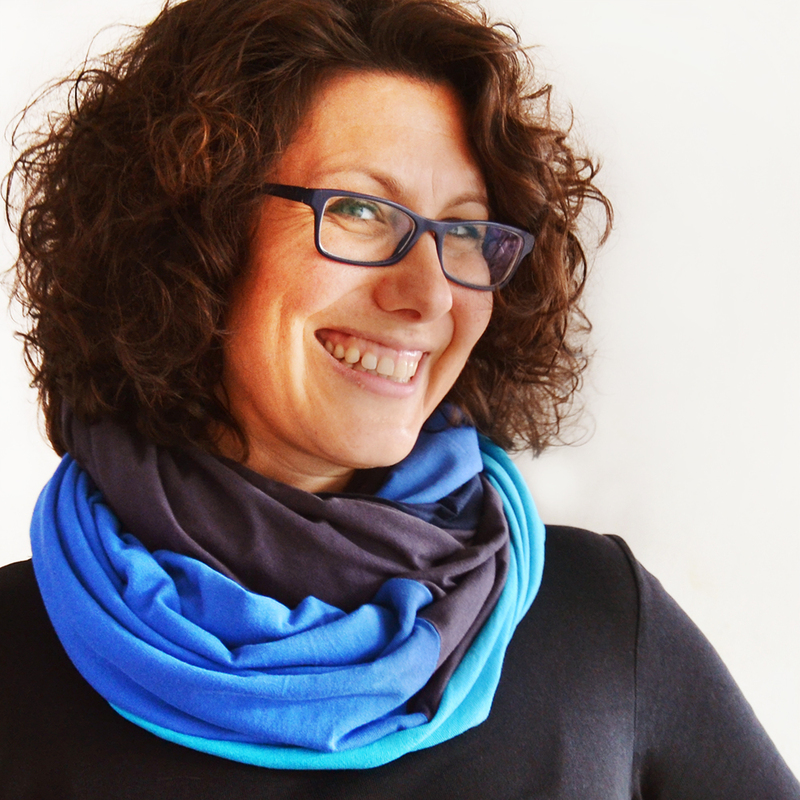 This post is part of the Learn to Machine Sew beginner’s sewing course! Once you’ve got a machine to work on, start learning about it in the first lesson, The Anatomy of the Sewing Machine! 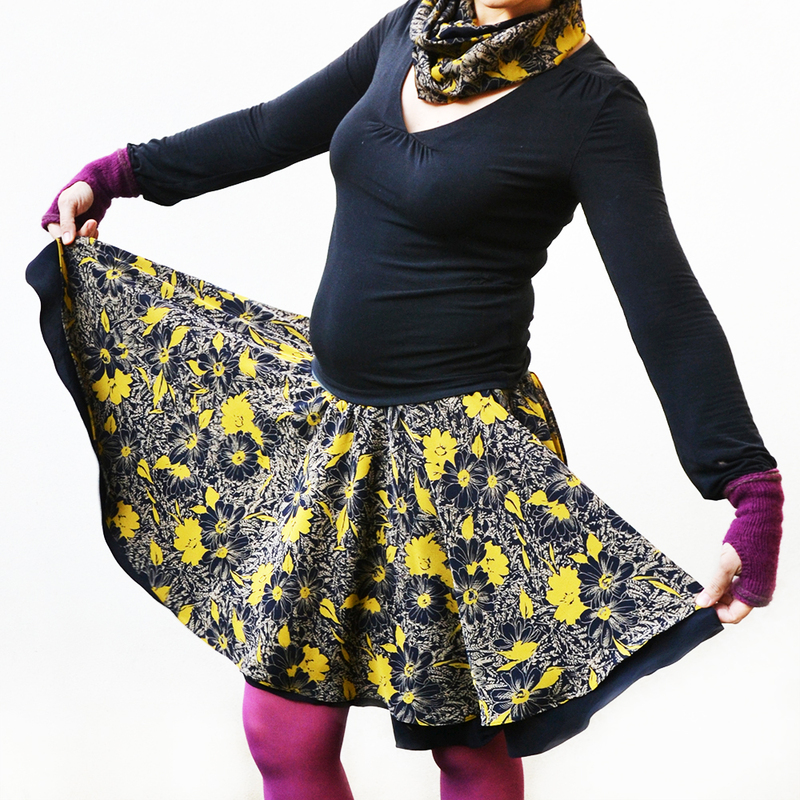 Previous articleHow to sew a circle skirt – free pattern! 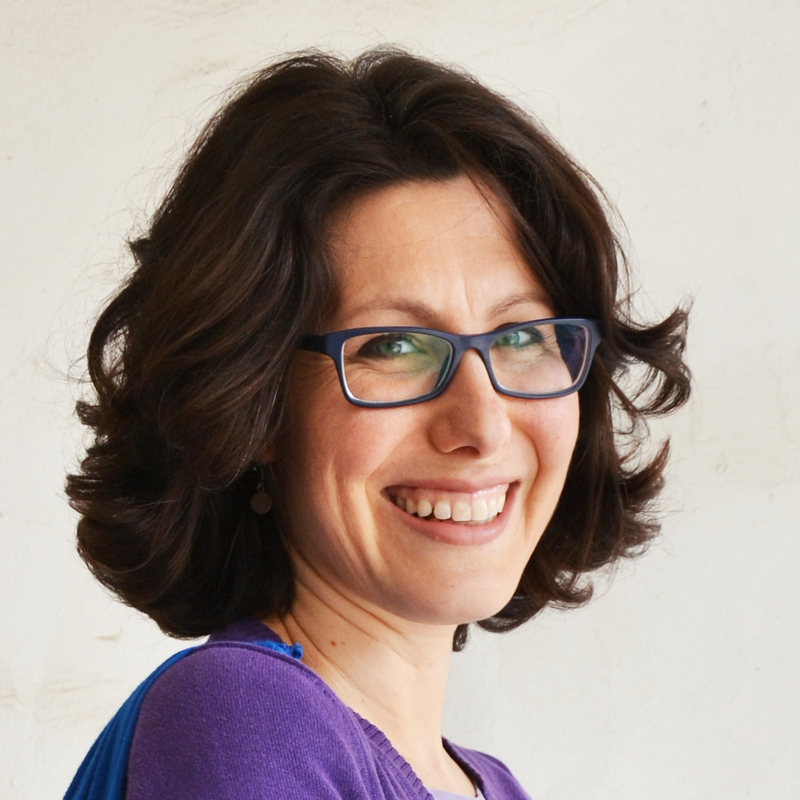 Grazie Lisa per queste utili informazioni, sei stata molto chiara. Io ho una macchina meccanica marca usquarna con qualche punto di bordure e penso spesso che acquistando una tagliacuci lavorerei più velocemente ma mi hai fatto capire di non avere fretta e imparare ad usare bene quello che ho e poi pensare ad una tagliacuci! Io adoro la mia tagliacuci e la uso spesso, ma secondo me è meglio che un principiante inizi a capire bene per prima la macchina classica prima di iniziare con altri tipi di macchine! Hai ragione che non c’è fretta, e c’è tempo per tutto! Questo post mi sarebbe stato molto utile quando ho detto a mia mamma che per Natale avrei voluto una macchina da cucire. Diciamo che più o meno ero arrivata a delle conclusioni simili, ma solo per un pelo non le ho fatto acquistare una macchina “base” cioè quelle da 100 €. 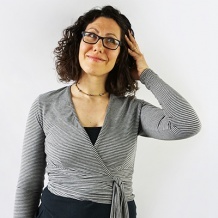 Per fortuna una mia amica mi ha fermato in tempo. Purtroppo è stata acquistata da un grande rivenditore di elettronica (nota catena che comincia con “E”) perché sia io che mia mamma viviamo in piccoli paesi e perché… mi sono decisa 2 giorni prima di Natale! 🙄 E’ una Singer Talent 3321, meccanica, e per il momento mi ci trovo bene. Da qualche giorno non mi funziona più l’infila-ago automatico, ma forse è colpa dell’ago che ho messo? Boh. Ne avevo una con il mobile disponibile (era di mia suocera), ma non l’ho voluta perché non avrei saputo dove metterla (e meno male! Non credo che potrei fare a meno del braccio libero!). Ha una buona varietà di punti (compresi quelli elastici che ho utilizzato per fare i famosi colli di pile e maglina) e diversi piedini. Credo che il prezzo si aggiri intorno ai 250 €. L’unica cosa che secondo me manca è la borsa. La vecchissima Singer di mia mamma ha una custodia rigida con cui la può portare ovunque e dentro a cui può riporre anche il pedale. Questa qui invece ha una inutile foderina fatta di odioso “tessuto-non tessuto” che si infila da sopra (con un buco per il manico) e che serve solo a non farla impolverare. In questo modo, non avendo una stanza, né un tavolo dedicato per cucire, devo sempre trasportare macchina, pedale, cestino per il cucito, cartamodelli ecc. separatamente, perdendo un sacco di tempo. Quindi mi sono lanciata nella titanica impresa di fare una borsa per la macchina! Per farla sufficientemente robusta avrei dovuto usare stoffe pesanti che forse avrei avuto difficoltà a cucire, quindi ho pensato di farla senza manici, tipo una scatola con un coperchio bucato da cui esce il manico della macchina. In questo modo lei si porta da sola, ma posso mettere nella borsa (che ho dotato di tre tasche) tutti gli accessori. Ancora non è finita, quindi vi saprò dire come viene! Strano dell’infila ago. Onestamente non lo uso mai perché lo trovo più semplice farlo manualmente. Non ci ho pensato di scrivere su una custodia/borsa! Non ho mai avuto una borsa che si può trasportare, solo la foderina. Quale tessuto hai usato per la tua borsa? Se usi un ago più grande (tipo 110 o 120) probabilmente non avrai avuto problemi a cucire il tessuto più pesante. Sono molto curiosa di vedere la borsa! Ho usato quilting cotton :mrgreen:. Rinforzato con Fliselina H630 e un’altra fodera termoadesiva do cui non so la marca perché l’ho comprata (a CARISSIMO prezzo) in una merceria vicino casa di mia mamma. Comunque è una di quelle fodere “tessute” (woven interfacing) che praticamente trasforma un cotone leggero in una stoffa più consistente tipo tappezzeria. Nella base ho messo anche un pezzo di quelle imbottiture semi-rigide che si trovano dentro alle scatole dei computer e roba così. La mia paura per le stoffe pesanti (ma i cotoni stampati sono così belli! 😉 ) non è per l’ago ma per la macchina: non vorrei fonderla subito! La borsa è quai finita, ma ora viene il bello: devo cucire insieme l’esterno e la fodera e temo che le misure non siano proprio identiche … 🙄 . Non sarà certo un capolavoro, ma dovrebbe fare il suo lavoro (spero). Ho fatto foto di alcune fasi del processo, quindi se vuoi poi posso mandartele. Ah, ho letto a fondo quasi tutto il corso “make a bag” di Ikat bag, che mi ha aiutato molto. Sì, quei stabilizzatori termoadesivi funzionano bene, ma tanto vale usare tessuti più pesanti già dall’inizio. Siccome non hai preso una macchina di quattro soldi, sicuramente ce la farebbe. Non ti preoccupare se non è perfetta la borsa. Per quanto mi riguarda, è più importante che sia funzionale e che ti piaccia! Really very informative.For the beginners and new sewing machine user its very important point to cover the which type of sewing machine are they seeking.Other major and important feature is sewing machine feet and speed. your tips are too great for me. thanks for the help. now we can make some choice by having these tips and make it better for our job. thank you. For the beginners and new sewing machine user its very important point to cover the which type of sewing machine are they seeking.Other major and important feature is sewing machine feet and speed.